One of two surviving golden coins stamped during the period of the foundation of the Kingdom of Pergamon is being exhibited at the Ere li Archaeology Museum in Konya. Ere li Archaeology Museum Director Mehmet Bilici said the golden coins' importance is down to their potential for providing valuable evidence about the economic and social conditions of the Kingdom of Pergamon. The other coin is still on display at the Bergama Museum in zmir. Pergamon was an ancient city founded on the Aegean coast of Anatolia at the site of the present-day city of Bergama. Located 100 kilometers north of zmir in the Bak rçay River basin, Bergama is one of Turkey's oldest civilized settlements, inhabited from pre-historic times through the periods of the Ionic, Roman and Byzantine civilizations. Noting that Pergamon was a city-state of the Roman Empire around 120 B.C., Bilici said that after establishing the realm the king stamped the coins as proof of the kingdom's independence from the Roman Empire. He added that they were also meant for commercial purposes to allow trade. The stamped coins were then released for public use," Bilici said. "The independent Kingdom of Pergamon was founded in this way. There's a stylized statue relief of the goddess Artemis on the backside of the 24-carat gold coin, and the goddess' head is depicted on the front. 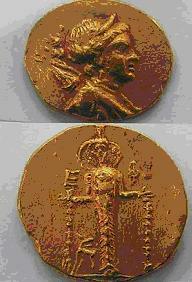 … The coins are very valuable in terms of world archaeology and art history, he added. How did the coin travel to central Anatolia? Stressing that only two golden coins remain from that time, Bilici said the one exhibited in the Ere li Archaeology Museum was unearthed from a tomb on a hill located five kilometers east of Ere li during excavations in the region in 1974. This golden coin, along with some other finds from the same tomb, is being exhibited at our museum. It'll be worthwhile to put these coins and the other unearthed items under comprehensive technical observation, as according to the age's religious beliefs coins were put into tombs for the dead as a gift to be given to the keeper of the Sirat Bridge, he said. However, it's a great secret as to how the coins came from Bergama to a central Anatolian settlement. Bilici said Ere li will also be a place of major interest for archaeologists and art historians from all around the world if the body found in the tomb is proven to be one of Alexander the Great's commanders, as some archaeologists presume. © 2005 Dogan Daily News Inc.